Over the last two months of blogging, connecting on Facebook, at festivals, as well as through my online website, I’ve connected with hundreds of folks. While most are from Guam, the CNMI, FSM, and from the mainland, it is difficult to predict just who you’ll meet next, or where your journey will take you. Most people contact me to purchase artwork that has been designed on my online store. However, this one instance would be a little different, and touching indeed. Last week, I received an email from a girl named Katie online who found out about what I did by reading our story in the Guam Pacific Daily News. Unlike the many others that just hop on my website and browse my illustrations, she had a different objective. She mentioned that she lived in Guam, and that recently she lost her grandma that she loved dearly. Her story was that she wanted to commission my services to develop a custom illustration of her grandma to be able to relive her memories and share it with her many other family members. She had an admirable goal in mind. I asked how she wanted to remember her grandma. She said she wanted a large illustration that she not only could frame in her home, but also share it with others. I asked more questions about her grandmother. I mentioned to her that not only can I design this for her, but that we should think of how this piece would be a valuable heirloom for her entire family. I suggested that this piece could be made available as copies to other family members as a unique gift that would be heartfelt and very meaningful. We began the planning process. She described her grandmother and her times where she would spend weekends together. 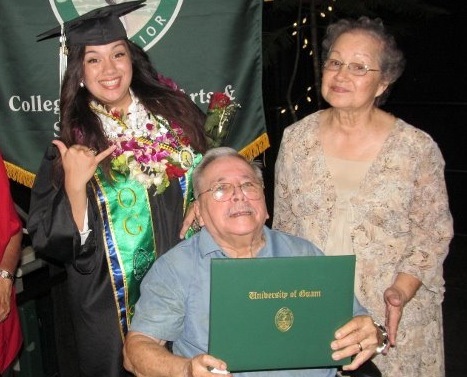 Her grandmother as a tradition would make a Chamorro dish called chicken kelaguen in her own kitchen. She described how her grandma looked, what she’d have on the table in preparation for making the dish, and other little things as part of the cooking process. As we discussed about life with grandma, I asked if there was anything special that brought back memories about being in that kitchen. Katie mentioned that her grandma would always have purple orchids in a blue vase on the table in the kitchen. She also added that she wore a silver wedding ring on her finger. This was something that she remembered distinctly. As I asked what photos she had of her grandmother in her kitchen, she said that she only had random photos that could only be used to assist in building this concept. So with a couple of photos she provided, a little back and forth discussion to understand what her grandma was like and the environment that she remembers, I went to the drawing board. I created a life-like illustration depicting her grandmother standing in her kitchen, actively preparing a dish of kelaguen for the family. Adding a smile to grandma can only enhance the satisfaction and value of seeing her as she was remembered. 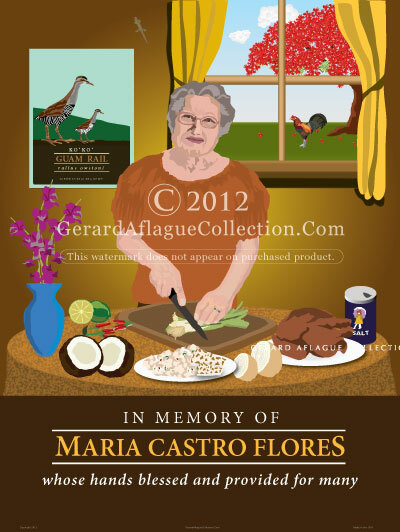 While her illustration included a beautiful vase with purple orchids, I couldn’t help but add a few of my personal illustrated pieces among others, such as the Guam Rail poster on her wall, a small gecko walking the wall of her kitchen, a flame tree in her back yard, and of course, a rooster walking across her lawn. While we could have made her illustration exactly what grandma’s house was actually like, it would have restricted our creativity, and the potential for making this piece not only special, but also strikingly beautiful. All told, she gave me free reign to be as creative as possible. We finished her illustration in about three days, and after going back and forth on email to try to refine the illustration, she finally was able to see the finished piece and she was nothing short of ecstatic. She said “I love it! it really looks like my grandmother! Thank you soo much! My dad wants an illustration too and I know my other relatives will want a copy for themselves. Thank you again so much and God bless!! If there was any illustration that I have done that has brought me so much satisfaction, it probably has to be this piece. I not only had an opportunity to design something so meaningful and beautiful for someone else, but I also connected with the story behind the art piece. I’m just happy that I could be of help to someone who wanted to relive their memories with someone they loved so dearly. Kate. If you’re reading this, I hope that this illustration that we worked on together will bring you years of enjoyment and the opportunity to share with your extended family your memories of your grandmother. I know its hard to lose someone you love, however, this is your memory that we were able to illustrate and bring to life for others to enjoy. I believe as the years pass, your illustration will be more and more meaningful as you will be able to share this special moment, not only with family and friends today, but also with others that will only know grandma through picture (such as your own children and grandchildren). God bless. Gerard Aflague has a passion for illustrated art and being able to share his interpretation of his culture and the many things that embody it. He is a self-taught illustrator. If you would like to contact him, he can be reached at gerard.v.aflague@gmail.com or you can call him in Denver at 703-508-9989. Sunday, April 22 was a special day for my family and the Gerard Aflague Collection. This is the day that Guam found out about our efforts to design and market cultural art and illustrations for homes and offices, among other things, across the United States and the Pacific on my website. The Pacific Daily News, Guam’s largest newspaper owned by Gannett Co., featured a full two-page lifestyle article on our business identifying how we got started, and adding some tips to help the aspiring online entrepreneur. Click to read the article here. We are encouraged that the Guam Pacific Daily News asked to feature our efforts to promote the culture in the Marianas. I want to thank Therese Howe in Virginia for her time and that of the staff for helping to share my story online and on print . It is an honor to be part of something bigger, and I hope that I can continue to be a source of digital cultural art to a wider audience across the world, network with organizations to share my skills and talent, as well as work with non-profit organizations and other cultural groups to be a global source for educating the world about Micronesia and the many cultures that make up this region. I’m excited to announce that we’ve started to release a line of apparel, starting with t-shirts as part of our effort to expand our product offerings. In an effort to differentiate our product offerings from many others who sell t-shirts, I’ve come up with the following list. Unique lines – While many other island t-shirt companies come up with a very focused or random method of determining designs, we have come up with three tee shirt lines focusing on 1) the youth demographic, 2) nostalgic designs, and 3) highlighting our flora and fauna. Single and multiple colors – While most t-shirt companies that make island tees focus on one, two, and three color combinations in their designs, we have made an extra effort to not only provide for these color combinations, but we also are happy to offer full color designs that allow us to be limitless with our colorful expression. Reasonable Prices – We have worked with Denver based providers to identify quality tees, while at the same time allowing for lower price points in order to pass along the savings to you. While we have started with our full-color tee line at $19.99, we expect that our single, double, and triple color offerings will be priced less than this. Most of our competitors are pricing their island tees between $19 and $29. Free Shipping – All our tees are priced with FREE shipping to addresses across the 50 states, all U.S. territories, including Guam, and affiliated areas including APO/FPO, CNMI, FSM, and Palau. Gift Wrapping Available – If you plan to purchase a tee and would like to ship it to another address, we would be happy to wrap it in distinctly beautiful island style gift wrapping. New Designs Weekly – Check back on our website as we will be offering new island designs weekly. Heck, check back daily. You might be surprised. So now that you know the low down, all you have to do is try ordering one of our distinctly and uniquely designed tees today. We are sure that you’ll be happy with your experience and with your purchase. Before I go, I should share one more thing. Because we not only sell tees now, but also an awesome line of island themed posters, stickers, and other stuff, you can order a bunch of stuff and be a happy camper when you receive them all. To see our newest line of products, click our Gerard Aflague Collection tee line, and when you see a tee you like, please spread the word by “liking the page” with our Facebook button. Check back often as we are putting up new designs almost every day! We are expanding on our offerings. In the days ahead, our website will be adding full-color sticker decal products to our collection of offerings. While most decals that are offered across the web only provide for basic illustrations, we will offer both single color, vinyl material, and full color images illustrated by me personally. Unlike traditional sticker decals, we will be offering the ability to customize any illustration that we have available as a sticker by adding a short name of your choice to it. For example, we just added rooster decal stickers to our line of products. While it already has predesignated names on them, such as “Saipan”, etc., we can replace it, or add to it so that you have a unique product that you would be wanting to display proudly on your car, laptop, wall, or other smooth surface. Our sticker decal material is non-fading, waterproof, and can be applied both for exterior or interior applications. All our stickers will now be contour cut to provide for a more beautiful and professional display. We plan to offer free shipping on all our sticker products and expect to migrate to that in the near future for all our other stickers. Remember, we ship to all 50 states, U.S. military installations, Guam, CNMI, the FSM, and Palau, among others. Feel free to comment in response to this post if you have any special custom requests on what illustrated decals and stickers you would like designed for your car, i-pod, or home’s interior wall. Chief Quipuha, also known as Chief Kepuha, was an interesting leader in his own right. As the Chief of Hagatna in the 1600s, he was the village chief who received Pale San Vitores and his entourage as they made there way into Guam as part of their missionary efforts spreading the Catholic faith. So much controversy surrounds the demeanor of Chief Quipuha among the natives at the time. It turned out that he was very cordial to the missionaries and made an effort to accomodate their stay in the island. Some say that Chief Quipuha may have wanted to elevate his village’s prominence with their presence. While others speculate various motives. As I did not know, Chief Quipuha had a son who was aptly named Chief Quipuha II. He was more of a rebel than his father. As the story goes, he was less than pleased with all the plans that the missionaries put into action as part of their efforts to turn natives into bible believing and God fearing villagers. Chief Quipuha is embodied in statue in the village of Hagatna in Guam. Interestingly enough, while the statue itself was funded with federal monies as a result of the rebuilding of the island after its destruction from Typhoon Pamela in 1976, it was more than just an icon for tourists and villagers alike to appreciate. The character of Chief Quipuha is such that many Chamorros espouse the leadership of this great ancient Chamorro. In 2008, in honor of his qualities, they decorated this statue with a moon shaped bone pendant necklace. So much can be said of this great leader in the writings of the Spaniards. 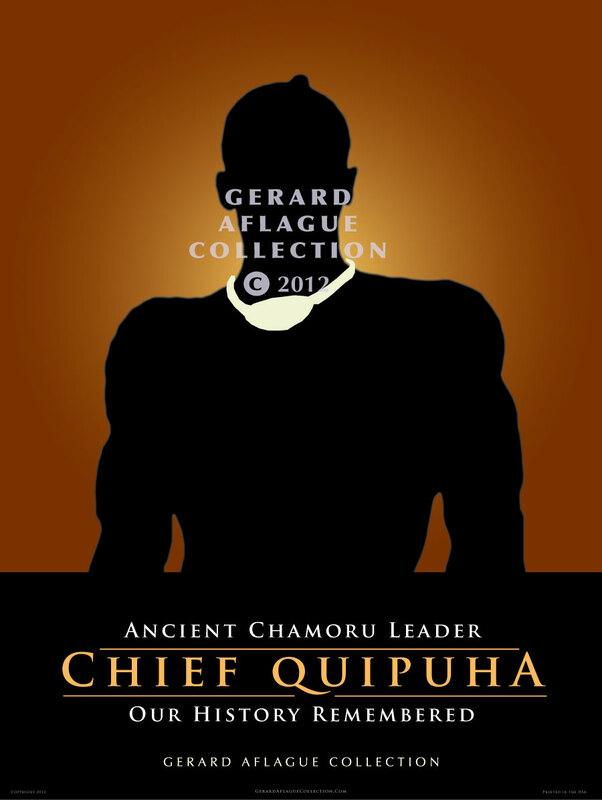 For more details of the illustration of Chief Quipuha, click here. 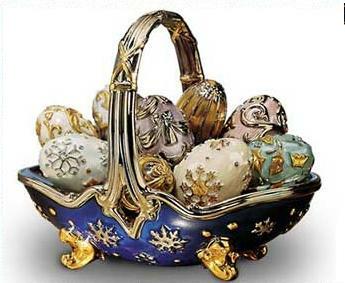 While Easter Season is a wonderful time to celebrate with egg hunts and easter baskets, we cannot forget the real reason we are celebrating this time of year. Our Savior, while sacrificing on the cross for our inequities, finally won the battle over evil, and rose from the dead. In this act of finality, we are promised something so precious and so free. While he gave everything for each of us, we receive His gift through His grace. So during this Easter Holiday, may we all remember the real reason for the season, and take part in celebrating with family and friends for it is because of His blood that we are set free. Did you know that Guam villages have their own flags? Yup. They do. In fact, it’s been a little over a year since Guam adopted these flags representing the culture and landmarks of each village. This effort is aligned with the Guam public law on the establishment of such flags. Guam Code Annotated 2000, §1031 reads that the various Municipal Planning Councils of the Territory may adopt an official municipal flag which depicts the history and culture of the respective village. However, efforts to publicize their achievement have been paltry. 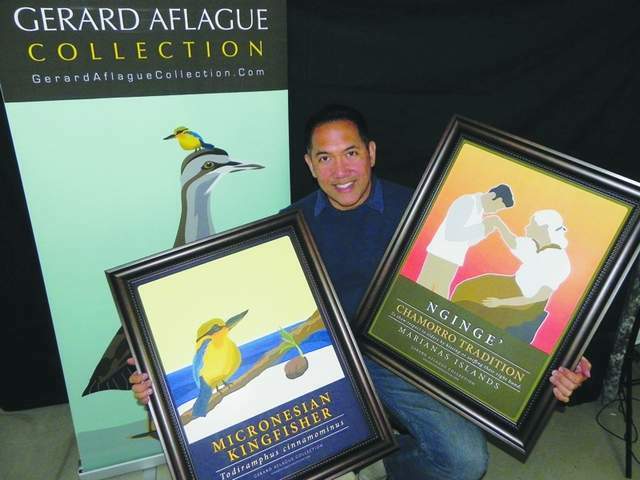 With this knowledge, Gerard wanted to do his share and elevate the awareness of these flags to the general public by designing and publishing Guam Village Facts and Flag Illustrations. By using social networking sites to ask Guam residents their opinion, he was able to gauge their interest. We are encouraged by the response. Many of those who viewed them were drawn to the flag colors and complimentary design elements. Many felt it embodied their village and captured a few of their landmarks. Additionally, the illustrations in total represented their village and they said that they were really intrigued by the designs, Gerard said. With all Guam 19 municipal flags available online, interested customers now have an opportunity to purchase and display a unique illustration that represents their Guam village.